Today, let's make use of confusion. The University of Houston's College of Engineering presents this series about the machines that make our civilization run and the people whose ingenuity created them. Let's think about teachers who've touched our lives - left us changed and improved. Then let's think about the most clear and understandable teachers. Now: How much do the two lists overlap? I know that every teacher who really caused me to learn did so by setting my brain awhirl in frustration - left me struggling with conflicting ideas. The ones who laid things out in perfect clarity left me nothing to process. Information flowed in-one-ear-and-out-the-other. Nothing could happen in between. The Alchemist. 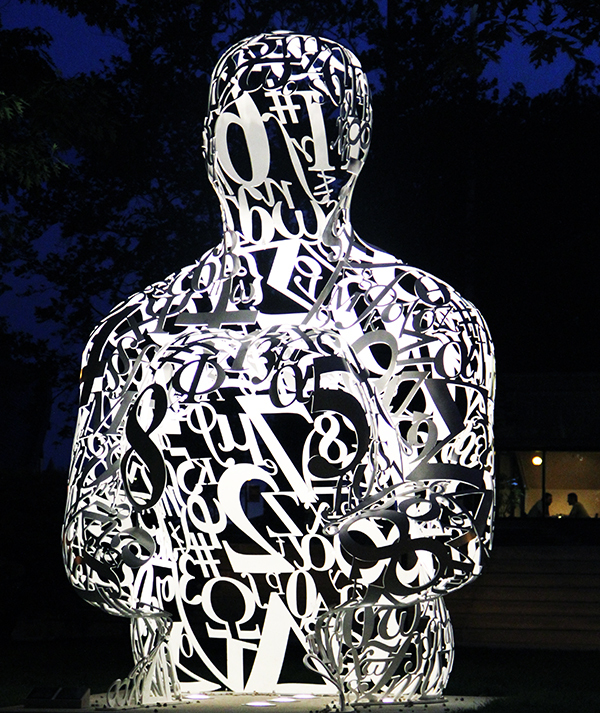 A sculpture on the MIT Campus in which a person emerges from a confusion of symbols. Engineer Derek Muller has picked up on this fact. He has a remarkable YouTube channel called Veritasium. The Latin suggests Truth as a chemical element. But I see it more as Truth emerging from fragmentary elements. You see, Muller sets out to create situations where we have to claw our way out of confusion. Example: he talks about gravity with people on the street while they handle two balls. The balls have the same size but much different weight. The concepts of mass and inertia are what make gravity tricky. And he uses the balls to expose those ideas by leading people into, then out of, one misconception after another. He makes the point that we must struggle to come to grips with any new idea. I can tell someone that the force needed to accelerate a body equals the body's mass times the acceleration. But those words do not constitute understanding. Better I should ask people to push a 100 lb cart and a 1000 lb cart as hard as they can for five seconds. Measure the acceleration of each; then ask what rule might explain the difference. We have to wrestle through any such concept to make it our own. The confused meandering of this river in NE Canada is dictated by physical principles which were analyzed by Albert Einstein. So Muller concocts two videos about Newton's laws. One is clear, accurate, and concise. The other is circuitous. It makes the viewer struggle. Students who watch the first video like it. Then they show no improvement in before-and-after tests. Another set of students calls the second video confusing. They don't like it at all. Then they do twice as well after they've seen it. 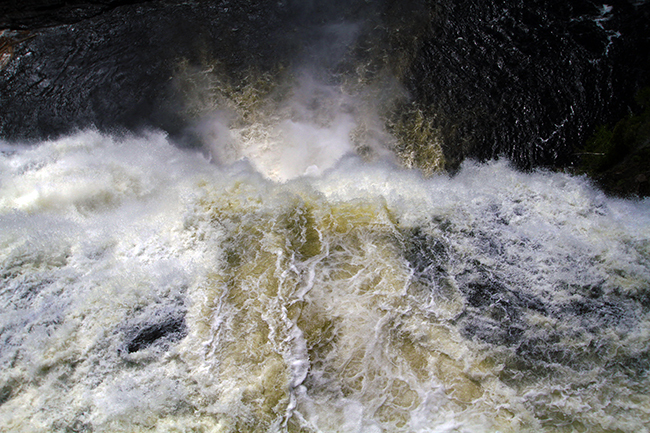 The confusion of water going over the top of Montmorency Waterfall, Quebec, Canada, all in accordance with Newton's Laws. You've heard me talk about two professors telling me what entropy was. One said, "It's just something used to organize steam properties." The other called it an "index of the order of the disunity of the universe." Those wildly divergent explanations, both true, were pure confusion. But together they opened up my ignorance so knowledge could flow in. Now entropy makes sense. Planners of San Francisco's Exploratorium scolded founder Frank Oppenheimer about how he made visitors struggle with ideas. They said, "But Frank, this is the real world." Oppenheimer shot back, "No it isn't. We made it up." He meant, of course, that science is human experience, codified. It's reality recreated, systematically, in our minds. We own science only when we do that exercise of reality recreation. But we have to do it. No one can ever do it for us. I'm John Lienhard at the University of Houston, where we’re interested in the way inventive minds work. Veritasium is described in Wikipedia, and Derek Muller discusses Veritasium in this TED talk. This is the Veritasium You-Tube site. And here is the demonstration with two balls. Frank Oppenheimer was J. Robert Oppenheimer's younger brother and he also worked at Los Alamos during WW-II. Wikipedia provides an intriguing short biography. All photos by John Lienhard. 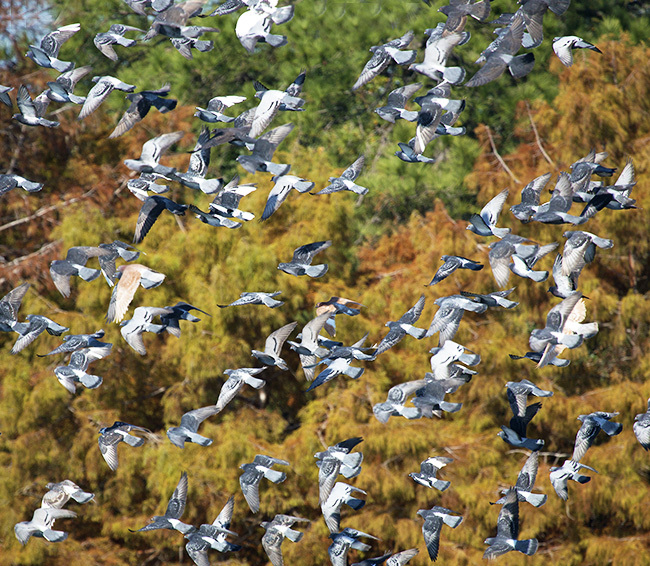 A confusion of pigeons in flight in Hermann Park, Houston -- and each knows what it is doing.